3) We didn't have a lot of space and didn't want a lot of "stuff"
Diaper Genie, baby monitor, bottle washing insert for dishwasher, Mega Blocks,Wet Wipe warmer, crib, rocking chair, baby gate, burp pads, Jolly Jumper. Some of those things made absolutely no sense for us. Diaper Genie? Nope. Baby monitor? Our apartment was so small we could hear anything from another room. Bottle washer? Breastfeeding (little did we know you can use bottles for that too) Wet Wipe warmer?! Its called a warm wash cloth. Mega Blocks?! For a baby?? Some made a lot of sense. Crib? Good idea (we ended up co-sleeping so didn't need it) Rocking chair, our baby hated being rocked, bouncing was more his thing. Baby gate, won't need it for a while, but a great idea, same with Jolly Jumper. Some things we just didn't know. Burp pads? What's a burp pad and why do we need it?? My son is now a little over a year, and some of our friends are expecting and asking the same sort of questions. We sat down and came up with our own personal list. For better or worse, here's what makes our parenting lives easier. As a cloth diaperer, this is my absolute #1 can't live without. Yes, it's a bit of a luxury item, but for me, it's the absolute bomb! We did 8 months without one, and pretty much as soon as my son stared solids we got one of these. Yes, yes, oh heavens yes! 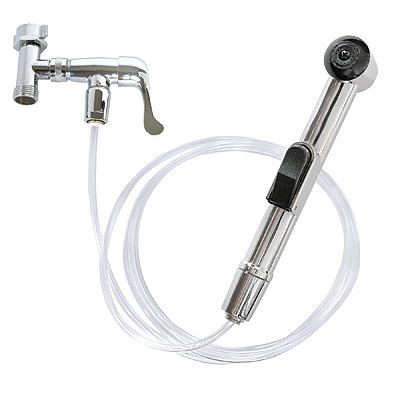 No more plunge and scrub in the toilet. Solids sprayed right away. Love this, love, love LOVE. Plenty of companies sell them, and there are more than a few DIY tutorials online. If you plan on cloth diapering, I say get one of these. 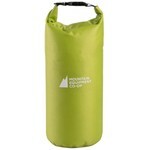 Also in the cloth diapering vein, a dry bag is a must for us. Wet bags are AWESOME, but when there's a poopsplosion or a vomitorious maximus you want a dry bag. Stuff stays in, smells stay in, diaper bag stays clean. They are super easy to clean up after said event as well. We have two, and one is in the diaper bag 100% of the time. A baby carrier gives you the amazing ability to hold your baby AND use both hands. They are, for lack of a better word, freedom. We have many carriers, and they vary based on what we are using them for. As a newborn I carried our wee one in a wrap. Then we graduated to a Mei Teier and a sling inerchangably, then a structured carrier. No matter your preference on style, a baby carrier is an invaluable addition to parenting. Once our little guy got a wee bit bigger, this was a lifesaver. It was something we could pop the munchkin into and he would be happy while we did something else. Making dinner? Baby in his rocker in the kitchen, but out of danger. Have to go to the bathroom? Baby in his rocker in the doorway. Want to eat dinner with both hands? 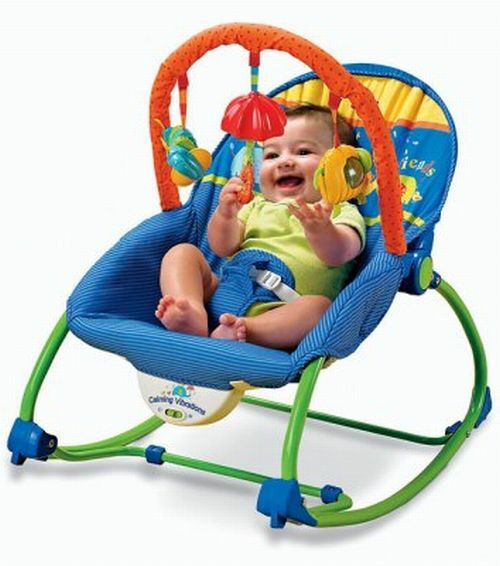 Baby in his rocker beside your chair being rocked with your foot. Having a bath with the baby? Baby towel in the rocker, put the naked slippery baby in the rocker, then get out and dry yourself. The dangleys keep the baby occupied, the rocking is soothing, and stuff still gets done. There was a short period we could use it (our guy kept trying to jump out once he could roll over) but while we could, AMAZING. Last but not least are the baby legwarmers. Adorable, fashionable and useful. We loved these things! Baby was warm and cozy and diaper changes were a snap! They come in warm and cool sun protecting materials and every design under the sun. No more worrying about the bum size in pants! Great for under pants and they don't ride up in the baby carrier. Added bonus? When baby outgrows them, they make great sleeves or wrist warmers for Mum and Dad!! So, there you go. Our top 5 products for parenting. What are your top 5? What can you not live without? Welcome to the almost-relaunch of my site. Please bear with me as we get new photos up for all our fabulous new products. It won't be long before you can browse and shop to your heart's content.